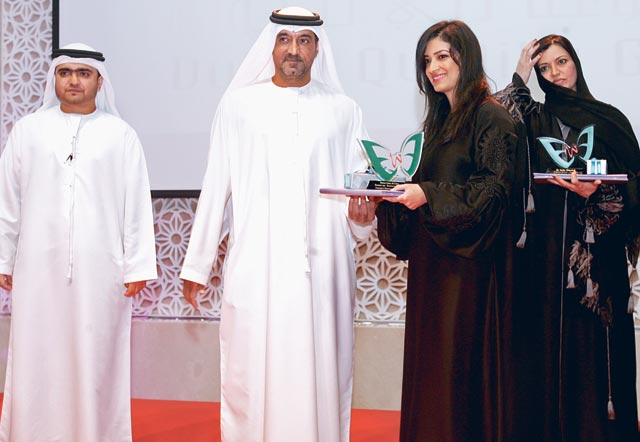 Dubai: Shaikh Ahmad Bin Saeed Al Maktoum, President of Dubai Civil Aviation and Chairman and Chief Executive of Emirates airline and Group, honoured the winners of the Emirates Women's Award (EWA) yesterday. Dr Wafi Dawood, Chairman of the Dubai Quality Group, said: "EWA receives high appreciation and tremendous recognition for its role as a tool contributing to accelerating economic growth since it helps to create a platform to support commercial activities and professional development of women, whose capabilities don't receive their due attention in the economic field." In recent years, EWA has identified leading women who have become examples for others due to their success and excellence in various fields, he added. The ceremony recognised the achievements of the winners in the presence of a large number of businesswomen and other professionals. "Emirates Women's Award has achieved unparalleled success throughout the past six years. We are committed to going on with this success in the seventh edition of the award by making a central change to the criteria," Dawood said. "This is in line with our strong belief in the importance of honouring and recognising the achievements of women in the UAE in various fields, which effectively contribute to advancing and accelerating development in our great nation." Raja Al Gurg, Chairwoman of the Dubai Businesswomen's Council and head of the EWA Judging Committee, said that businesswomen's investments in the UAE have surpassed Dh12 billion. She said there are 11,000 businesswomen in the UAE — 4,300 in Dubai, 3,200 in Abu Dhabi, and the remainder spread across the other emirates. EW encourages women to participate in boosting the UAE's economic growth. This is achieved by focusing on the contributions of leading women with a view to motivating others to make best use of their capabilities and experience, she added. Shabana Karim was the winner of the business award, and Muna Al Gurg took second place. Mariam Al Afridi won the professional award, and Rawda Mohammad Al Mehrazi was runner-up. Haifaa Bousamara won the leadership award, Laila Mohammad Taher the award for financial planning and performance, Asma Mousa Abdul Rahman the award for career achievements, Salwa Mohammad Hadi the award for social contribution and Dr Aisha Al Bousmeet the award for innovation.